Zynga’s smash hit FarmVille is about to reach a new audience of future tractor riding, crop harvesting fiends. 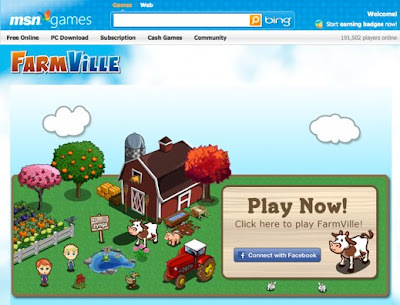 Today, the company announced that FarmVille will now be featured on MSN Games, Microsoft’s casual gaming portal. This marks the first time that a Zynga game will be featured on a full-fledged gaming site. And it’s only the first step: Zynga says that more of its games will be appearing on MSN Games and Windows Live Messenger in the near future. Unfortunately it looks like you’ll need either IE or Firefox to get this working (sorry, no Chrome or Safari). Which is just stupid, given that FarmVille works fine on just about every browser out there when you play it on Facebook. We’ve asked Zynga why this is — it almost certainly has something to do with the way MSN Games is set up. Zynga has made no secret of its desire to expand its games beyond Facebook.com. In November, the company launched a dedicated web portal at FarmVille.com, and it’s doing the same thing for other games as well. Of course, the games still pull in a user’s social graph through Facebook Connect, but by deploying these games outside of Facebook proper, Zynga can get more control over the gaming experience (in the case of its own websites) and gain greater distribution (in the case of deals like this one). And Zynga still has 75 million users playing FarmVille on Facebook every month. In honor of the launch, MSN Games has skinned its site with a FarmVille theme.